The new MX-20MT mixer/pump gives contractors a high-output, easy-to-use unit for superb productivity on shotcrete and refractory work in a variety of applications, including steel mills, cement plants and petrochemical plants. The machine provides twice the output of the company’s popular MX-10 mixer/pump yet has nearly the same compact footprint. It’s mounted to a single-chassis trailer for convenience as well as fast and easy transportation, setup and cleaning. The MX-20MT features a 1-metric-ton mixer with a high-speed hydraulic agitator that keeps materials blended and in suspension as it flows to the 4-inch swing-tube piston pump. The pump operates with up to 2,200 psi pumping pressure for consistent installation of as much as 20 metric tons of material per hour. Customers can vertically pump refractory material in excess of 300 feet and load the hopper with as much as 2,500 pounds of material. Farrell added that designing equipment around customer feedback is in Blastcrete’s DNA. The company did it in 1996 with the release of the MX-20MT’s sister model, the MX-10, which became the industry’s most popular unit. 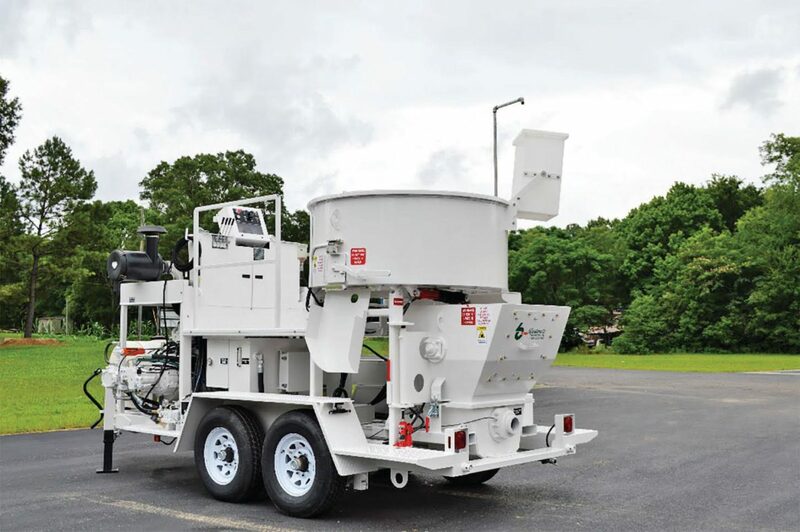 Blastcrete Equipment Company releases the new MX-20MT Mixer/Pump, which features a 1-ton capacity and 20-tph output, all from a single-chassis unit. single person, which saves labor and time. Blastcrete preserved the popular swing-out hopper in its latest model, giving users quick cleanup and maintenance. Additionally, the 20-minute quick-change-out 4-inch flat pack provides low-cost insurance for contractors in quick turnaround installations. No other pump in the world offers these features, Farrell said. Blastcrete offers an optional 2,000-psi hydraulic pressure washer for easier cleanup and an automatic lubrication system to ensure proper greasing of the swing-tube pump. 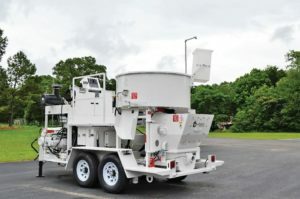 The MX-20MT’s 22-square-foot platform provides 50 percent more space than competitive equipment to give operators ample room to maneuver for safe operation. The electrical controls are mounted on the platform and positioned away from the mixer to remain free from debris and water. Customers can also use the unit with Blastcrete’s patented DustAway system, which consists of an innovative bulk bag design that attaches to a mixer to contain dust as the mixer fills. DustAway helps businesses meet impending OSHA regulations for crystalline silica dust by controlling dust to within new OSHA permissible exposure limits. The MX-20MT features electric braking and lights for enhanced safety when traveling. Lifting eyes on the platform allow operators to use a crane to lift the machine and place it on a flatbed for traveling longer distances. Blastcrete offers the MX-20MT with an optional skid-mounted framework that reduces the overall length, width and height of the machine. The new MX-20MT is equipped with a 173-horsepower John Deere Model 6068HF water-cooled diesel engine. Blastcrete also offers the unit with electric motors. The engine on the MX-20MT is placed away from the mixer and receiving hopper to prevent thermal transfer that causes refractory materials to set prematurely. The MX-20MT is CE-certified to meet European Union safety standards for equipment operation.